A recently discovered system, Anamere, holds a primitive race on a beautiful, tropical water world - that also happens to be well endowed with minerals and biological treasures. Will a simple anthropological survey mission to find out more about the water-loving Anamians remain simple, or will it turn into something quite different? They might even not be as primitive as they appear. 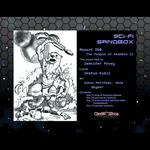 This Sci-Fi Sandbox contains everything you need including system information and a system map, five character write-ups, nine mission complications and ground and space encounter systems. As a bonus it also contains species information on the otter-like (but not always cute) Anamians.